Full of eggs that look as if they're nestled in the grass, this Easter Egg Table Topper is perfect for your dining room table. You can even set a basket of eggs on top of this 19" circular topper to help complete the Easter setting. 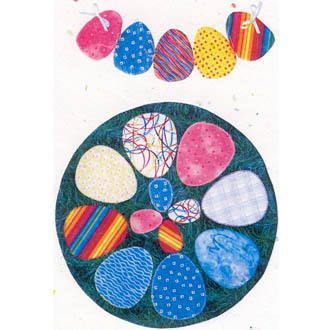 Made with fusible applique, this Easter Egg Table Topper is perfectly complimented by the Easter Egg Swag. Measuring 16" long, it's a great wall decoration for the holiday & easy to make. Price includes shipping and handling.